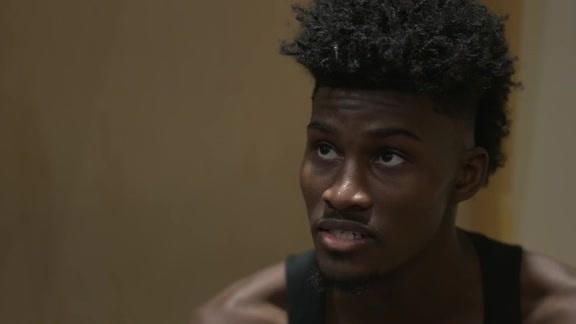 ATLANTA – Like a plant absorbing sunshine, water and nutrients and methodically sprouting upward, Orlando Magic second-year forward Jonathan Isaac continues to soak in everything thrown his way and blossom almost nightly. Fresh off a win in Milwaukee when the 21-year-old Isaac led the Magic in scoring for the first time in his young NBA career, the nearly 7-foot forward continues to show signs of becoming the five-tool, transformational player Orlando thought he could become when it selected him No. 6 in the 2017 NBA Draft. He came into Sunday night in Atlanta averaging 11.3 points, 7.8 rebounds, 2.0 blocks and 1.2 steals while shooting 44.8 percent from the floor with 11 made 3-pointers in the previous 10 games. During that run, he’s scored in double digits six times, he’s set his career high in rebounds twice and he’s blocked at least two shots eight times. On Saturday in Milwaukee, Isaac hesitated early in the game on three early 3-point shots, but he worked his way out of it as the game progressed. He finished 17 points – one off the career-best 18 he scored on Oct. 22 in Boston. Also, he six rebounds, blocked two shots and made three 3-point shots – shooting that has a big-time trickle-down effect on the Magic offense, said Magic center Nikola Vucevic. Clifford raved recently that Isaac is ``killing it now,’’ in terms of his improved intensity, focus and defensive activity of late. Recently, when the Magic whipped Minnesota, Isaac had 13 deflected passes to go along with his six rebounds, three blocks and two steals. BRISCOE HAS COME A LONG WAY: There are times, Magic reserve guard Isaiah Briscoe admitted, that it dawns on him just how far he’s come in a year’s time. This time a year ago, Briscoe – a native of New Jersey who played collegiately at the University of Kentucky – was playing professionally in Estonia. Briscoe actually loved his time in Estonia, a country of approximately 1.3 million people in northern Europe that is bordered by Finland, Sweden, Latvia and the Baltic Sea. While there, he scored 50 points in a Latvia/Estonia all-star game and he won an award for being the league’s best young player under the age of 23. Now, some time later, Briscoe has carved out a role on the Magic where he is the team’s back-up point guard by veteran starter D.J. Augustin. He had his best game as an NBA player on Saturday, scoring nine points, handing out seven assists and making his first four shots, including a 3-pointer. That growth has him occasionally contemplating how far he’s come. Briscoe, who was once rated as the top point guard in the nation when coming out of high school, got invited to a free-agent camp with the Magic following his strong season in Estonia. From there, he fought his way onto the Summer League roster and earned a spot on the regular-season roster. Over time, he has beaten out Jerian Grant for the backup job while improving as he’s seen more consistent playing time. In his last five games, he’s scored 20 points, handed out 21 assists, grabbed 17 rebounds and swiped three steals. Daily work with Hetzel – one of Orlando’s assistant coaches assigned to helping its young players improve – has helped him grow, Briscoe said. UP NEXT: After a well-deserved off day on Monday following two games in the past two nights, the Magic conclude their five-night, three-game road trip in New Orleans on Tuesday. The Pelicans, who refused to deal superstar forward Anthony Davis at last week’s NBA trade deadline, are one of two teams that the Magic have yet to play this season. The Memphis Grizzlies are the other. The Magic will be back at the Amway Center on Thursday for the final game before the break for the NBA All-Star Game.